Price and performance together can be considered a rarity when it comes to laser printers, but small to average work groups and offices will be thrilled with the Brother HL-4070CDW for their printing needs, packing a sturdy design and boasting a great performance for printing monochrome and color prints at a very inexpensive price range. 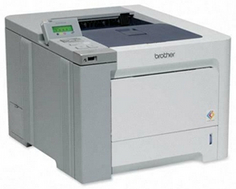 The Brother HL-4070CDW, being Brother's "franchise printer" for its line of color laser printers has a number of features that hold a lot of promise in terms of performance, design and usability. The HL-4070CDW has a 2,400x600-dpi maximum resolution for its print engine, which is quite impressive for a laser printer. It also has wireless networking capabilities and hi-speed USB 2.0 function, which enables the user to print documents and files from a USB flash drive or any USB device such as digital cameras, USB compatible mobile phones, and external hard disks without the added effort of connecting to a computer. The HL- 4070CDW has dimensions of 12.5x 16.5 inches (height x width) and an 18.7 inch depth. The HL-4070CDW features a minimalist design with its cube shape and simple design finish of the cream colored front panel matched with a grey side panel. Its design also allows for an easy set up and convenient placement as the user loads everything on the front panel, certainly suitable in cramped up spaces albeit its bulky and heavy set facade. The HL-4070CDW can handle letter, legal and executive paper types on its main paper tray, including an assortment of A and B type papers. Its multipurpose tray can handle envelopes and custom-sized paper, from 2.5 to 8.5 inches in width and 4.57 to 14 inches in length. Another nice feature is the HL-4070CDW's efficient power consumption, being qualified for an Energy Star merit. Its power consumption details are 23W when in sleep mode, 85W in ready mode (once the machine has warmed up) and a 510W once printing is underway. A 300MHz processor and 64Mb memory provides this printer with much of its speed, clocking at a rate of 20-22 pages per minute for both monochrome and color prints. 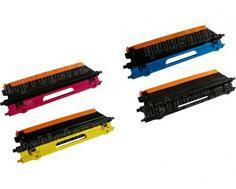 Its RAM can also be upgraded up to 512 MB, which should significantly increase its speed. Other features of the HL-4070CDW are duplexing capabilities for double side printing and PostScript compatibility, which can be done through emulation. The HL-4070CDW, with prices that can go as low as $320 and its remarkable speed in color printing is certainly suitable for high volume, quality color prints and quite ideal for a home or small business setting. The wireless networking set up can be quite a hassle to work on especially for beginners or those who are new in wireless network printing. Its color printing capability, although remarkable at 20 pages per minute, still leaves room for improvement in quality, particularly hues that might appear not quite refined and blotchy edges for a very detailed image. Its menu display only has a single line interface, which is less preferable compared to colored and multi-line displays found in most printers similar to it. Another caveat is its noise while printing, which turns off a number of users in an era where noise production/reduction have become a considerable factor in choosing or buying printers. Review it: "Brother HL-4070CDW "
The HL-4070CDW tray is capable of holding up 250 sheets with an additional multi-purpose tray of 50 sheets. 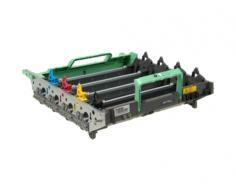 It can also be upgraded to have a 2nd paper tray for an added 500 sheets. It also comes with a standard-yield monochrome and color toner cartridges with 2,500 pages and 1,500 pages, respectively, both at 5% coverage. The drum unit is at 17,000 pages before needing replacement, while the belt and waste toner box have a 50,000 page and 20,000 page yield respectively before replacements are required. With the HL-4070CDW's efficiency, print costs can go as low as 1 cent for monochrome prints and less than 8 cents for color prints.